Continuing with our SDCC 2016 Sherlock coverage (Part 1: “A Case of Sexual Identity”), we get into the nitty-gritty of making a show as popular and engaging as Sherlock. While Sherlock’s cast and crew are notoriously hard to get any spoilers out of, the greatest of Sherlock sleuths might be able to glean a hint at what to expect in Series 4 (and hopefully beyond — fingers and toes crossed!). During press for Sherlock on Saturday, we sat down with Executive Producers and Writers Steven Moffat & Mark Gatiss, Executive Producer Sue Vertue, and actress Amanda Abbington (Mary Morstan). First off, we asked how difficult it is keeping the plot under wraps in this day and age, where people are actually using drones to find out who is filming on this season of The Walking Dead in order to discover who Negan’s victim might be. GATISS: “We do get criticized for lying, but we have to. Moffat and Gatiss then gave us a tiny bit of insight into Sherlock series 4 when asked about their inspirations outside the Arthur Conan Doyle canon. Holmes and Watson returning to their Victorian roots, even for so brief a time, in ‘The Abominable Bride’ was so well received, a lot of people want to know if we’ll be returning to Victorian England anytime soon. Another trip to Sherlock’s Mind Palace, perhaps? It’s been widely reported that Moffat recently said series 4 would be the final series of Sherlock, but as the first part of the interview referenced, this was a case of the media misinterpreting, or misrepresenting, a quote to suit their own agenda. With the careers of Martin Freeman and Benedict Cumberbatch taking off, how difficult is it then to create the serialized portion of the story? 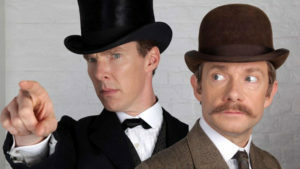 And, we had to know – do they give us a cliffhanger so Martin and Benedict feel like they have to come back? The interview ended on a joke. Is there a third Holmes brother? It was an emotional conversation with the Sherlock crew, but it ended in laughter, and it’s clear to us that the people working on this show are as passionate about their show as their fans are. Sherlock Series 4 will air in on the BBC in the UK and PBS in the US sometime in 2017. Air date to be announced. Probably two weeks before, considering the BBC. I feel like I should say something here. Look, I’ve had Moffat lie to my face before. Believe me, I know he does it. But when he does it? It’s just another answer. It’s not an impassioned speech. I expected a couple sentence answer to this question. What I got was 5-10 minutes of both he and Gatiss expressing genuine frustration. This wasn’t a joke to them, they were genuinely frustrated, and even a little angry. Others who have listened to the audio felt the same. They meant what they were saying. There was real feeling behind those words. Could it end up being a lie in the end? I’d be a fool to say there’s no chance at all of that. But this one time, at least right now, I am absolutely positive they meant what they were saying. You don’t have to explain yourself, I’m sure 99% of readers believe you. You see, tjlcers have this cult-like mentality that makes them question everyone. Everything is staged, everything is PR move, they probably believe Moffat, Gatiss and BBC are spending millions to bribe every single journalist they talk with to keep this huge “conspiracy” in secret. Lol, what I think a lot of people don’t realize is that this happens in every single fandom. They use the same words, the same arguments. You’d almost think they cut and paste from one fandom to the next. I’ve seen it in every fandom I’ve ever been a part of, and I’ve been in a lot. The names and minor details change, but the idea of a conspiracy, hidden clues, staged PR, and even bribes is always there. Yes, you’re right, as I already mentioned, I have seen the same cospiracies and interpretations in Merlin, House, Supernatural and various other fandoms. (Daily Dot article which mentions your interview even compared them to Larry Stylinson shippers). In regards to Part 1 of this interview, I’m still not clear on what questions were actually asked. In the first direct quote of the interview, Moffat launches into all this impassioned dialogue, but it’s hard to get an idea of context when I have no clear idea as to the specific questions asked. Your questions in Part two where more clearly delineated, making this part of the interview easier to follow and digest. The exact quotes are on our Tumblr, but the paragraph before the first quote from Moffat really does convey it. I simply stated that I’d seen something going on in the Sherlock community when I did research, figured out it was in reference to Moffat’s quotes, asked if he’d seen them and stated that I felt they might have been taken out of context. I actually didn’t even have to clarify what those comments were in what way they were being interpreted. I said very little at that point. Just goes to show, they are aware of what fans are saying, whether you know it or not. Ah, okay. Thank you, very much for the clarification. Brilliant two-part article! Thanks for writing it. It sounds like the interview was great fun. Well done, I miss the written article, proper interviews. Not fan of red carpet vid sound bites. This was very refreshing. But those videos are so much easier to write! Lol. I am with you though. I prefer reading this kind of story, I just hate how long it takes to write it. Transcribing is evil. This was a group interview with both Nerdgeist and Anglophenia, which is how most interviews at SDCC go. The roundtables usually have 10 or so press people at them, so this was a small group and the only reason I can even tell you who the other interviewers were (usually you don’t know everyone). In group interviews everyone shares the content, regardless of whether or not they asked questions (most roundtables you get 3 or so peeps asking questions and everyone just piggybacks off them, whether because they aren’t assertive or they weren’t prepared, it depends).